In conjunction with Earth Day 2013, let me show you two flowers (or rather inflorescence) from two very common plant in Malaysia. Though these plants are very common in our gardens, they are not native to the Malesia region and are rarely seen in flower. The first one is the Ribbon Plant aka Lucky Bamboo aka Guan Yin Bamboo. This plant, scientifically known as Dracaena sanderiana, is neither a bamboo nor is it a native to Asia. This plant is actually native to Cameroon in tropical Africa! With various cultivars that have lovely leaf variegation, this plant is a hot seller during Chinese New Year, especially those twisted into various shapes or arranged into tiers. 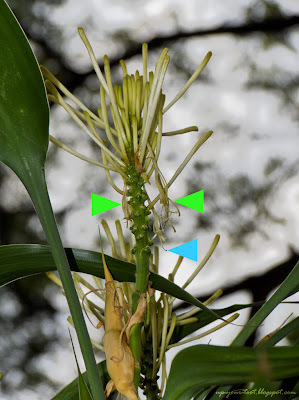 Like the more common Dracaena surculosa (sometimes called Japanese Bamboo), the flowers are whitish-green and opens at night, only to wither the next morning. The buds on the inflorescence of the Ribbon Plant (Dracaena sanderiana). This is the plain-leafed type. The stems are slightly over six feet in height. The flowers are scented, and probably smell a little 'weird' like those of Dracaena surculosa. 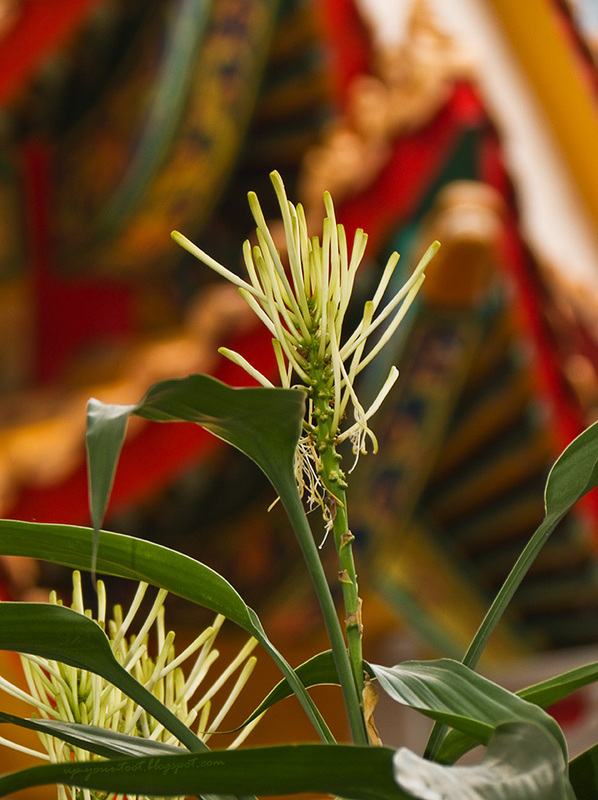 The photos of the flowering Draceana sanderiana was taken off a clump that was planted inside the Guan Yin Temple beside KLCC (Dharma Realm Guan Yin Sagely Monastery). 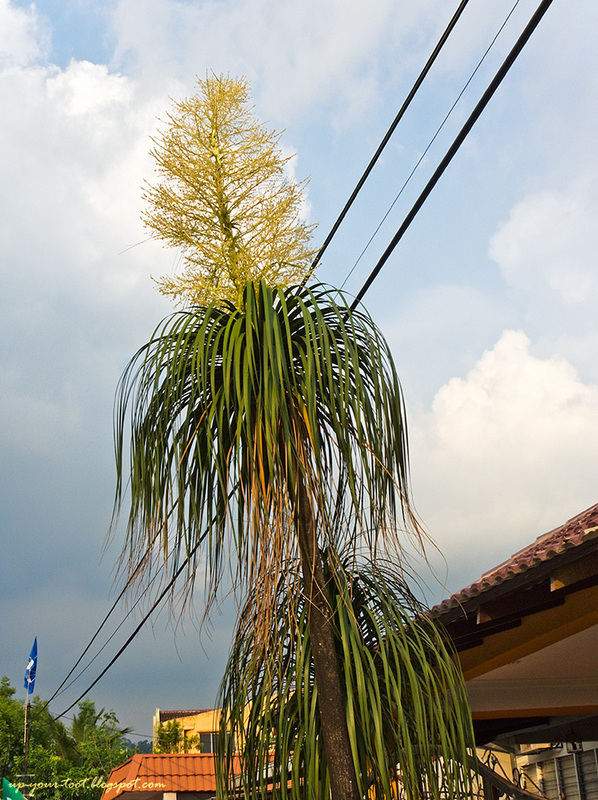 I was there on Guan Yin's Birthday celebration day and noticed that the clump had inflorescence on the taller stems. A closer look at one of the inflorescence of Dracaena sanderiana. The green arrows point to withered flowers whilst the blue arrow is pointing at a stigma from the withered bloom. The flowers unfortunately had all withered as it was past midday. As I didn't had a chance of dropping by at night, I didn't managed to capture the open blooms. However, from the withered flowers, one can still see the stigma and stamens. The next plant is the ponytail palm aka elephant foot plant. Again the common name of this plant is a misnomers, for it is not a palm but more related to the Agave, Asparagus and Sansevieria. Formerly known as Nolina, but now placed into Beaucarnea, these caudiciform plants are very popular as 'feng shui' lucky plants in Malaysia. 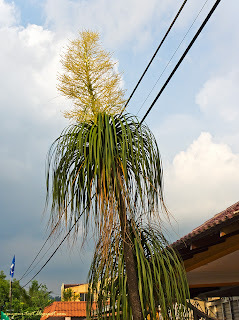 The plant featured here looks like a Beaucarnea recurvata or possibly B. gracilis and it is growing on a little patch of soil by the driveway, along the road leading to Kelab Darul Ehsan in Taman TAR, Ampang. A flowering Beaucarnea (possibly B. recurvata). Undilah parti pokok Beaucarnea...the flower stalk vying for attention with the various political party flags that lined the road. The nice middle-aged lady that owns the plant told me that the plant was left by the house's previous owner, and that she had cared for it for many years. She hadn't noticed the flower stalk until she was informed by passers-by. The inflorescence was light green in colour when it was emerging, but now has taken on yellowish-cream tones as most of the flowers had bloomed and withered away. 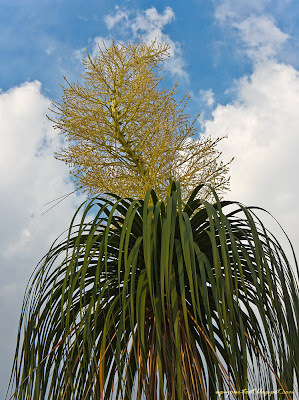 Inflorescence of Beaucarnea, with yellowish white flowers that attracts a lot of little bees. 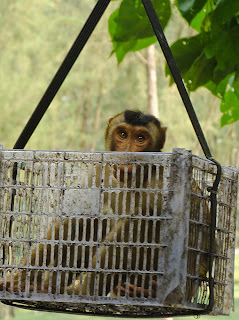 Haven't you seen a monkey in a basket?? Like Jack-in a box, Genie in a bottle...No??? You spotted the most amazing pony tail palm!! I haven't seen this plant in bloom yet. Oh I think it was there for ages. I have been growing a little one and it doesn't seems to grow big fast. 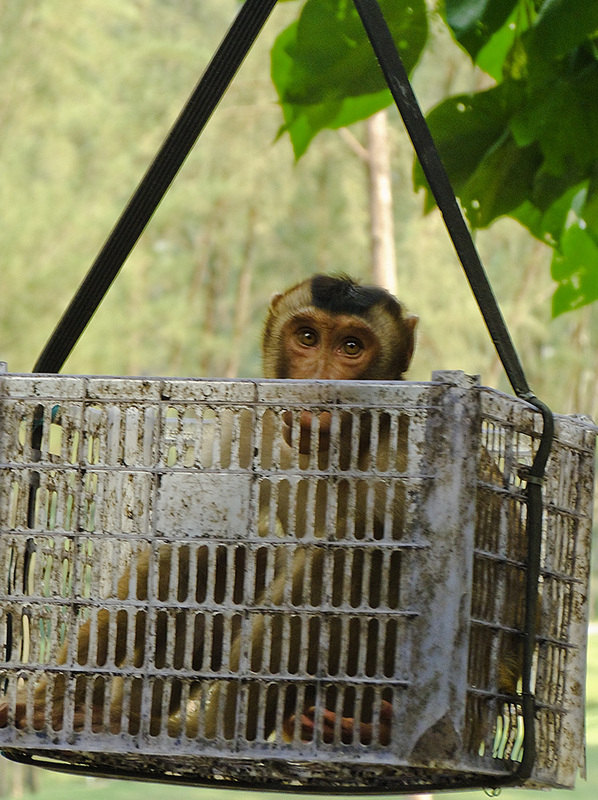 If I have a banana at hand, I'll definitely pass one to the monkey. Happy Earth Day Sean L! Enjoy the greens in our surroundings. The plant is still in bloom. So if you're around Ampang, just drive up to Taman TAR. Happy Earth Day Stephanie. Oh ponytail tu really attract attention. Dekat Sabah ni macam-macam ada bentuk bendera sampai I pun tak kenal which party. I saw several tourist mistaken some party flag as Sabah flag. Rather than the flag I tengok pole tu great for trellis. Bestnya kalau dapat kumpul nanti. I pun tengah aiming kayu pacak bendera - nak jadi papan lekat orkid. Aduh, sampai jadi confusing kepada pelancong, memang over sangat. Hahaha...Sampai masa tu, kempen pilihanraya jadi kempen cabut dan kutip kayu. Wah ..everbody aiming for the poles ya.. nak join juga.. btw unik pokok yg sama naik dgn poles tu..
Jom sama-sama kutip. Maybe we can volunteer as pasukan menurunkan bendera lepas pilihanraya, hehe. Everyone that drives by will take a look. Siap makcik tuan punye pokok beri advice, boleh beli kat Sg Buloh. So terus batal niat nak minta anak pokok tu. Great write-up on Earth Day, Sean! The first time I see flowers of the Elephant Foot.